'FLOWERPOWER' VINTAGE VOICED ANALOG DISTORTION FUZZ BOX!!! True to vintage design. 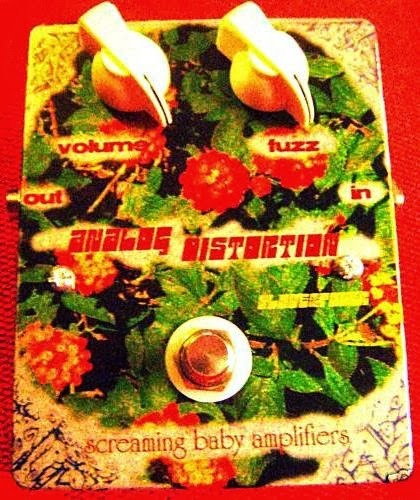 Beautiful blooming analog distortion/fuzz with excellent pick articulation and harmonics. Unlike some distortion boxes that are quieter than your dry signal, when you click this pedal on, you know it! Even at lower gain settings it is louder than your dry signal! At lower gain you get a full, pretty 60's overdrive, when gain is cranked you will get a heavy fuzz tone that produces wild oscillations and clipping at the tail end of your signal- MASSIVE AMOUNTS OF HARMONICS! This pedal is voiced with huge low end and full tone and sounds great with a bass as well as guitar!!! Positive ground, true bypass- solid die-cast box with top quality parts -tone capacitor is finest made in France today- dims 2 1/2" H x 4" x 5" approx. Handwired point to point for extreme retention of guitar tone and dynamics. So this thing calls for -9V and PNP transistors, does that mean I could use +9V and NPN transistors? Does it work that way? Sure. That should work with reversin the polarity of the 10µ cap. However, that would be pretty much NPN Si Fuzz face with clipping diodes at the output. I just made this in the way described above, ie reverse the cap and used 2n3904 transistors and it doesnt work, strange engine like sound that goes higher or lower in pitch when Fuzz is turned. No bridges, all grounds seem ok, bypass works, did I miss something silly? You kept the ground as is and just replaced the minus supply with positive? Correct, in that I have used exactly the same layout, except 10uf cap has been reversed, the grounds all goto sleeves etc connected to the black wire on the battery clip, the red one going to 9v (in the normal way ive always done so) Still this strange motor thing going on, I do observe now that low notes to cause it to oscillate slightly, kinda like that low fart on the bottom of a bad pitch bender, but then hidden slighlty by the "engine sound". Wow. Just came back to this now to try figure out why it didnt work. I put the diodes a strip too high, and a bridge 2 strips too high. I swear I checked it first time it didnt work. Must of been drinking or...something? unbelievable. Well If I want to make a diesel engine effect in the future im a few steps ahead! its been a while since I've verified anything, so i figure i'd do an easy one. you can tag it. I built it with the 2n3906's and it fired right up. its late here and the baby is sleeping, so all i could do was play through a crappy little solid state amp and even crappier headphones. it didn't sound bad, but i'll have to wait to really play with it. I tried building with the 2N3906's and the -9v, but I'm getting nothing out of it. This is my first experience with negative voltage, so will someone please explain to me how I'm supposed to do this? This is probably stupid, but I just hooked up the negative lead from the power supply to the -9V in, then the positive lead I sent to ground. How is this supposed to be done? First off thanks so much for this very very cool site. I built this one and it sounds great. After about half way on the fuzz knob I get some sort of a breakdown. Any suggestions on calming this down such that the full range of the knob is usable? Have checked and it's not a wiring problem. What about substituting the 4148s for BAT46/41 or a 1N270/34A? Just built this as had a wee bit o time after finishing my Kraken by Madbean (which is awesome by the way) and decided to use some Ge PNP tranistors. Used an OC72 with hFE of ~105 in Q1 and a B24A with Hfe of ~25 in Q2. Sounds really good don't get the harsness when the fuzz is turned up. Nice little build. Thanks as always to the Masters.